Oil dropped below $30 a barrel in New York for the first time in 12 years on concern that turmoil in China’s markets will curb fuel demand. West Texas Intermediate crude tumbled to the lowest since December 2003. Concerns that China’s economic growth may slow has soured investors on the prospects for a quick recovery, turning hedge funds the least bullish in five years. A rapid appreciation of the U.S. dollar may send Brent oil to as low as $20 a barrel, Morgan Stanley said. Oil extended a 70 percent drop since June 2014 as volatility in Chinese markets fueled a rout in global equities and U.S. stockpiles remained more than 120 million barrels above the five-year average. Saudi Arabian Oil Co., the world’s biggest crude exporter, confirmed on Jan. 8 it was studying options for a share sale, including listing “a bundle” of refining subsidiaries. "Psychology has completely taken over," said Stephen Schork, president of the Schork Group Inc. in Villanova, Pennsylvania. "Market sentiment has shifted so far that it’s self-fulfilling. There’s been a big cutback in CFTC positions, which shows that everyone is heading for the exits." WTI for February delivery fell $1.28, or 4.1 percent, to $30.13 a barrel at 2:07 p.m. on the New York Mercantile Exchange. The contract touched $29.93, the lowest intraday price since December, 2003. Prices lost 30 percent last year. Brent for February settlement decreased $1.05, or 3.3 percent, to $30.50 a barrel on the London-based ICE Futures Europe exchange. It touched $30.34, the least since April 2004. The European benchmark crude traded at a 37 cent premium to WTI. Oil is particularly leveraged to the dollar and may fall between 10 to 25 percent if the currency gains 5 percent, Morgan Stanley analysts including Adam Longson said in a research note dated Monday. Societe Generale SA cut its average 2016 Brent forecast to $42.50 a barrel from $53.75 on Monday, while Bank of America Corp. trimmed its forecast to $46 a barrel from $50. 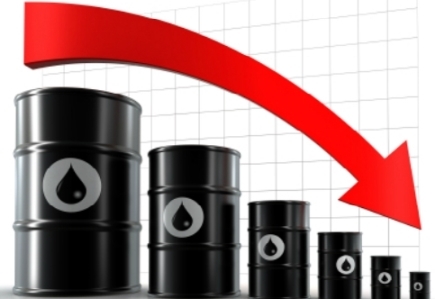 Crude also fell as the U.S. dollar strengthened, diminishing the appeal of commodities denominated in the currency. The Bloomberg Commodity Index, a gauge of 22 raw materials slumped to the lowest level since 1999. "There are no technicals holding up the price so we’re looking at a falling knife," said Jason Schenker, president of Prestige Economics LLC in Austin, Texas. "Concern about global economic sentiment and dollar strength are continuing to weigh on the market."